For thousands of years, the Judean date palm flourished throughout the Middle East, until the Romans conquered Jerusalem around 70 AD. Its fruits, dates, were a staple food in the region, and the tree was used as a natural remedy, and a potent aphrodisiac, since it symbolized fertility. In the Old Testament of the Bible, it is mentioned that King David named his daughter after the Hebrew word for the tree — Tamar — and in the New Testament, it is written that when Jesus came riding into Jerusalem on his donkey, his followers laid date palm leaves at his feet. The date palm is praised in both, the Bible and the Koran. It provided shade, food, and medicine, and dates were the honey in the “land of milk and honey”. They were used to make tonics for longevity, laxatives, and aphrodisiacs, and to cure infections. The date was so important to the region that it featured on ancient coinage, and even on Israel’s 10-shekel coin today. These trees were central to the Judean economy, so the Romans wiped them out, and by 500 AD, they were completely extinct. However, before they have entirely vanished, someone got an idea to preserve a batch of the seeds of this tree in a clay jar, and in the 1960s, this jar was found by archeologists in the ruins of Herod the Great’s palace. Carbon dating revealed that the seeds were about 2000 years old, and represented the last living vestiges of the long lost Kingdom of Judah. The ancient seeds were kept in a drawer for over four decades, and in 2005, a botanical researcher Elaine Solowey decided to plant one and check if it would eventually sprout. In an interview for National Geographic, she admitted that she initially assumed the food in the seed would be no good after all that time. Yet, she tried and was proven wrong. She soaked the seeds in hot water first, and then, she kept them in a solution of nutrients and enzymatic fertilizer. In January, she planted them in pots, and one of them sprouted by March! It became the oldest known tree seed to germinate. The plant was named Methuselah, after Noah’s grandfather, the oldest man in the Bible. Solowey said she just couldn’t believe it. 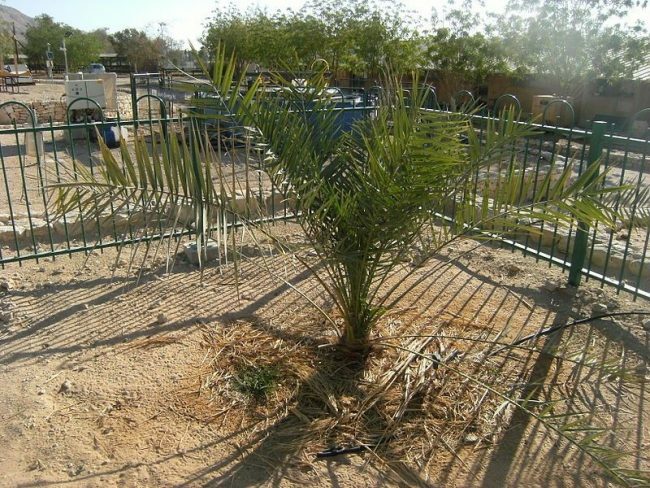 By 2010, the palm stood 6.5 feet tall. Solowey told The New York Times that if her date plant lives, it will still be years before we eat any dates, again, in case it was female. The tree continued to grow and thrive, and as of 2015, it was 10 feet tall, growing flowers and making good pollen. Yet, it turned out to be male, meaning that it cannot produce fruit, so researchers are now trying to sprout a female tree from the same batch of seeds. Solowey also tested the pollen of the male tree on a modern variety of a female date tree and found that it can make dates. If she succeeds, she says that it would help them learn what kind of dates they ate in those days and what they were like. The results from genetic tests indicate that Methuselah is most closely related to an ancient variety of an Egyptian date palm, which fits with a legend that says dates came to Israel with the children of the Exodus. Solowey aims at establishing an orchard of ancient dates, which would enable her team to investigate and find out any unique medicinal properties. Today, Methuselah is growing happily, and they hope he will be instrumental in bringing back the ancient Judean palm dates, which were valued for their countless medicinal properties, and amazing flavor.